This is an economy size 1-lb can. This has all natural ingredients and adds great flavor to the instant meal recipes. Click below for the vegetarian and beef versions. This is a great way to incorporate healthy whole grains into an instant meal. Click below for instant brown rice. These tasty noodles cook in just 3 minutes and come in a variety of yummy flavors. These tiny seeds give a nutrition boost to these instant meals. They take on the flavor of the other ingredients and disappear into the mix. This adds the flavor and protein of peanut butter in a dry powder form. This adds creaminess and calcium to the Alfredo Noodles. Click below for powdered buttermilk. This Mama Francesca brand tastes great and adds cheesy flavor to the Alfredo Noodles. These nest together compactly and are lightweight. 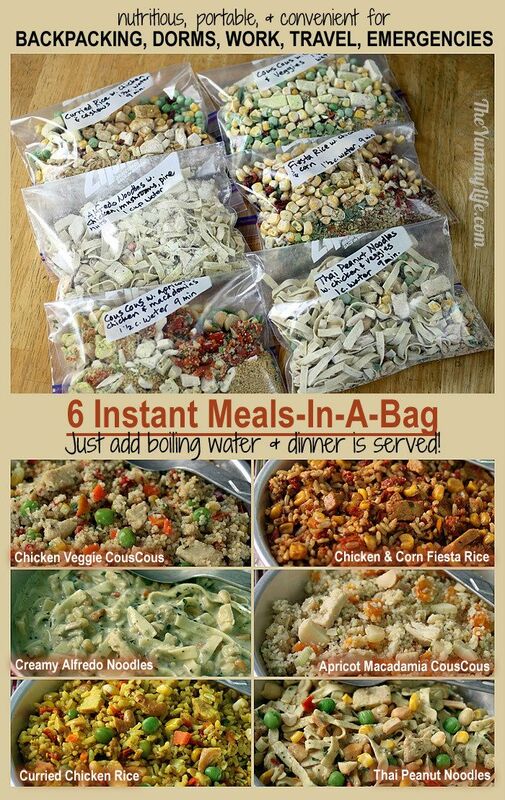 They work great for combining these instant meals with boiling water. 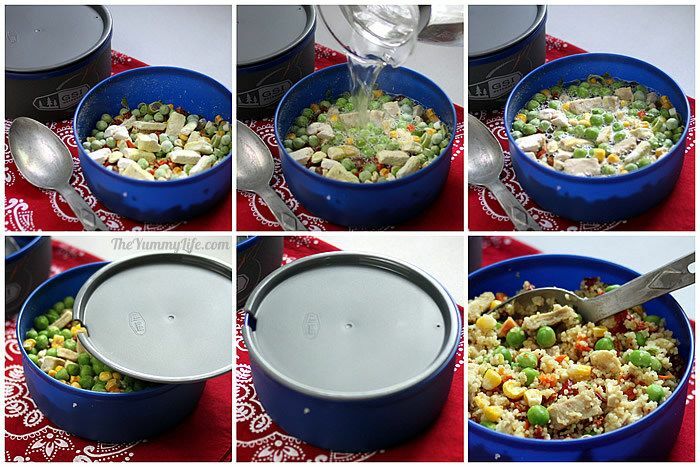 This is great for heating instant meals at the office or in dorm & hotel rooms. Click below for a plastic microwave-safe mug. 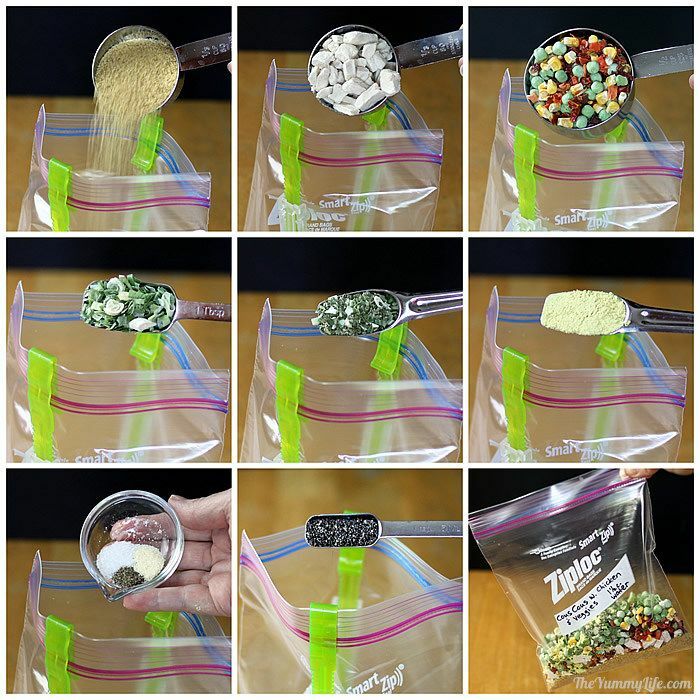 This makes filling plastic bags so much easier. It's like having an extra pair of hands. These are the perfect size for transporting and mixing the instant meals. They are sturdy enough to tolerate boiling water, so you can mix and eat right out of the bag. If you don't want to make your own, these are surprisingly tasty. I use this for preserving leftover freeze dried meat & veggies, because once their original packaging is opened they begin to decay & form bacteria. Vacuum sealing extends their storage life so they can be used in the future. This lightweight, compact pot/stove combo is highly recommended for heating water on the trail. This post is a bit of a departure for me. I am normally an only-fresh-ingredients-everything-from-scratch kinda girl. However, I'm married to an avid backpacker who often needs to take food on the trail that requires nothing but boiling water to make a meal. So, I set out to create some instant meals for King-Man that used prepared ingredients that were as healthy as possible. Flavor, nutrition, and portability were my primary goals. Recipe links. Here are links to each of the 6 complete printable recipes. Each is explained in more detail further down in this post. Also for meals at the office, in dorm & hotel rooms, and to stock for emergencies. These meals can be used any time you need a quick, instant meal. All you need is access to boiling water. I'm not saying they're an everyday substitute for meals prepared with fresh ingredients. But for an easy occasional meal, they're handy to have around and way more nutritious than ramen noodles and cup-of-soup type instant meals. 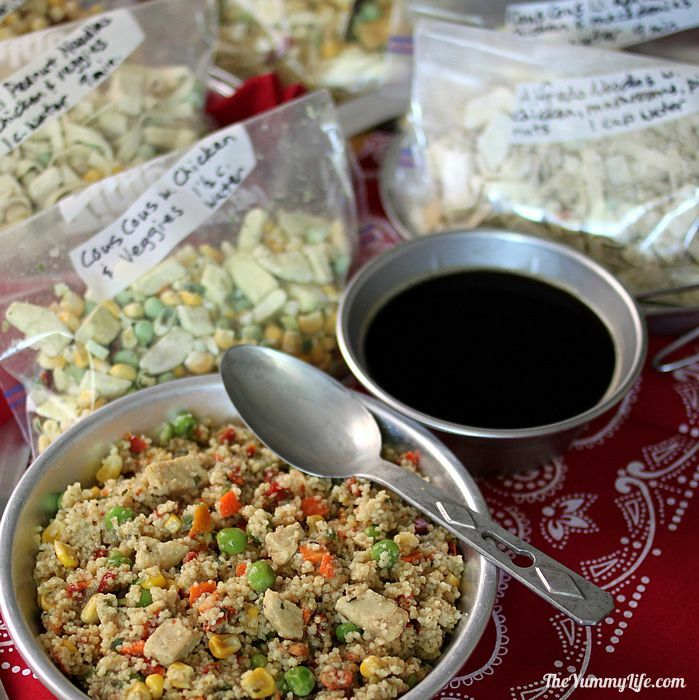 Ready-made freeze dried meals for the trail. Here's an example of one that is available to buy. They taste surprisingly good (Let's face it, after a long day of backpacking, pretty much anything tastes good! ), and they sure are convenient. King-Man particularly likes the Mountain House brand. But, he likes the instant meals I created for him better, so I can't imagine we'll ever go back to the store-bought kind. 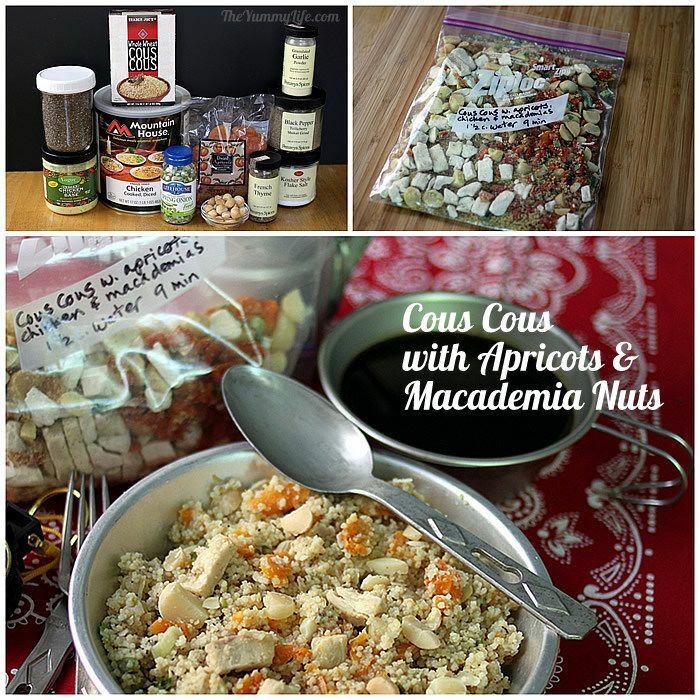 Cous Cous with Apricots, Macadamia Nuts & Chicken (per 1 cup serving): 312 calories, 17.1g fat, 653g sodium, 134mg potassium, 28.7g carbs, 6.6g fiber, 5.2g sugars, 12.8g protein. Notable nutrients: vitamins A & C, calcium, iron. Creamy Alfredo Noodles with Mushrooms & Pine Nuts (per 3/4 cup serving). 291 calories, 17.5g fat, 456g sodium, 227mg potassium, 21.8g carbs, 1.3g fiber, 2g sugars, 14.7g protein. Notable nutrients: vitamins A & C, calcium, iron. Curry Rice with Chicken & Cashews (per 1 cup serving): 378 calories, 10.9g fat, 377mg sodium, 386mg potassium, 58.2g carbs, 4.9g fiber, 1.2g sugars, 13.4g protein. Notable nutrients: vitamin C, calcium, iron. Not diet food. These 6 instant meals are nutritious but not designed to be low in calories, although some of them are fairly figure friendly. They are healthy in terms of nutrients like protein, fiber, vitamins, and iron; but they aren't necessarily low in carbs, calories, or sodium. After a long day of hiking, backpackers need calories, carbs, & sodium in their food. So, these meals are designed to provide nourishment for refueling; they're not necessarily for those concerned with weight loss to incorporate in a regular eating routine. But, they can be great as an occasional convenience for non-hikers. First I'll explain the variety of ingredients used in these recipes followed by what is used in each of the individual 6 recipes. They all use the exact same prep and cooking procedure. 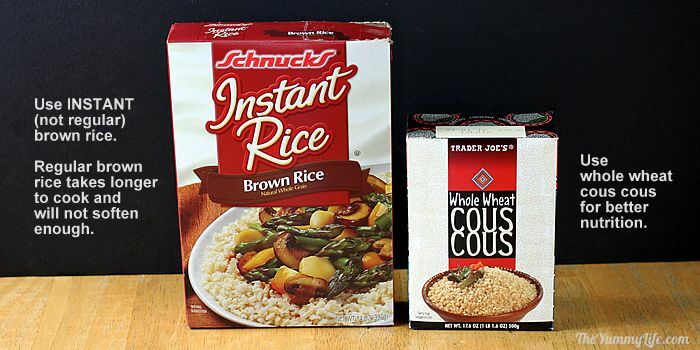 All 6 instant meals use either brown rice, whole wheat cous cous, or pasta. These can be switched out in any of the recipes, if you prefer one over the other. They all worked well and tasted good. However, the cous cous is the fastest to rehydrate when mixed with boiling water. It was King-Man's favorite. Rice and Cous Cous. For better nutrition, I recommend brown rice over white and whole wheat cous cous. One of the things I like about making my own instant meals is that I can use whole grains whenever possible--something missing from the store bought instant meals. It's important to use instant rice (same as Minute rice) rather than regular, since it softens more quickly in boiling water making it ready to eat without additional cooking. 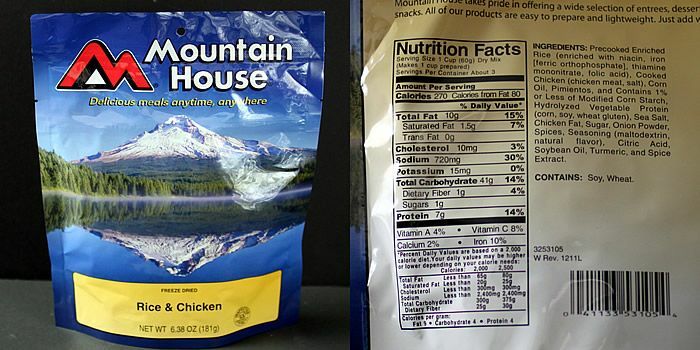 White Minute rice softens in half the time of brown Minute rice, so you may prefer to use it for backpacking meals. 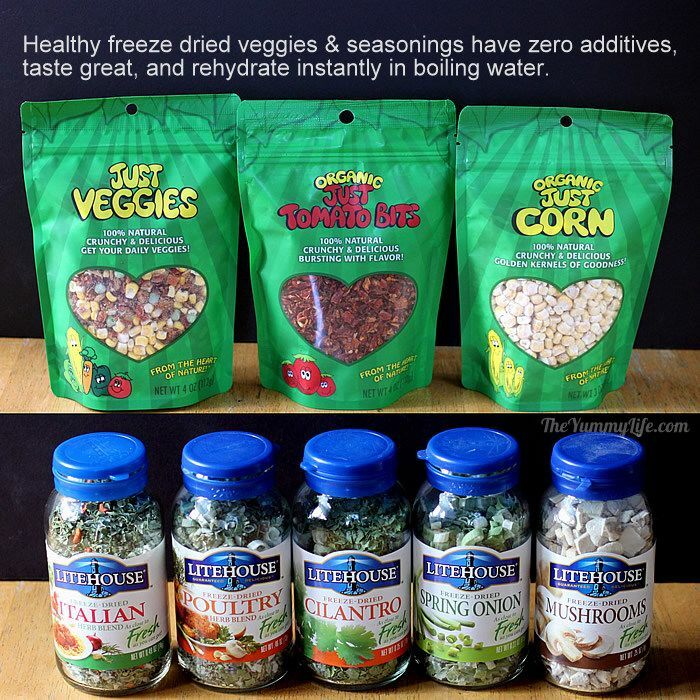 Freeze dried veggies rehydrate instantly in boiling water and taste surprisingly fresh. They have zero additives--100% natural and pure. I found these at my local grocery store. The Just Veggies brand is also available at Whole Foods and on Amazon. (These also make a tasty, healthy snack without rehydrating them--I snack on the crunchy mixed veggies straight out of the bag.) I used the mixed vegetables, corn, and tomato bits in these instant meal recipes; they're the easiest way I could find to add a variety of veggies & nutrients to the 6 different instant meals. Freeze dried herbs taste amazingly close to fresh herbs. It's fine to use the regular dried version that may already be in your pantry; but if you don't mind the expense, you can't beat the flavor of the freeze dried variety. I purchased these Lighthouse herbs at my grocery store. Amazon also has a good selection. Dried spices. These are some of the additional dried herbs and spices I used in my 6 instant meals. I'm a fan of Penzey's, can you tell? 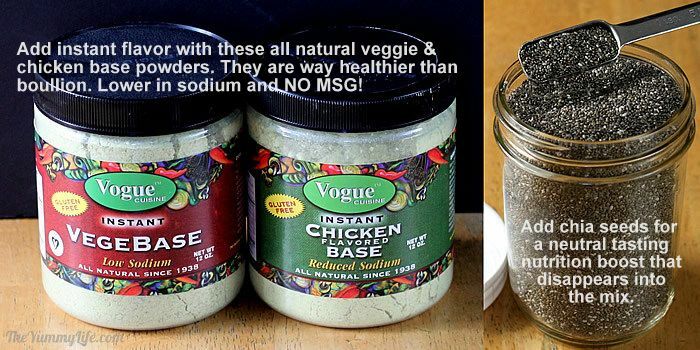 Vogue Cuisine VegeBase or Chicken Base is added to all 6 recipes. I did a lot of shopping around to find a flavor booster similar to boullion but without chemicals, MSG and mystery ingredients. The Vogue Cuisine brand uses real, natural, gluten-free ingredients and it does a lot to enhance the flavor of the 6 instant meal recipes. I highly recommend it. 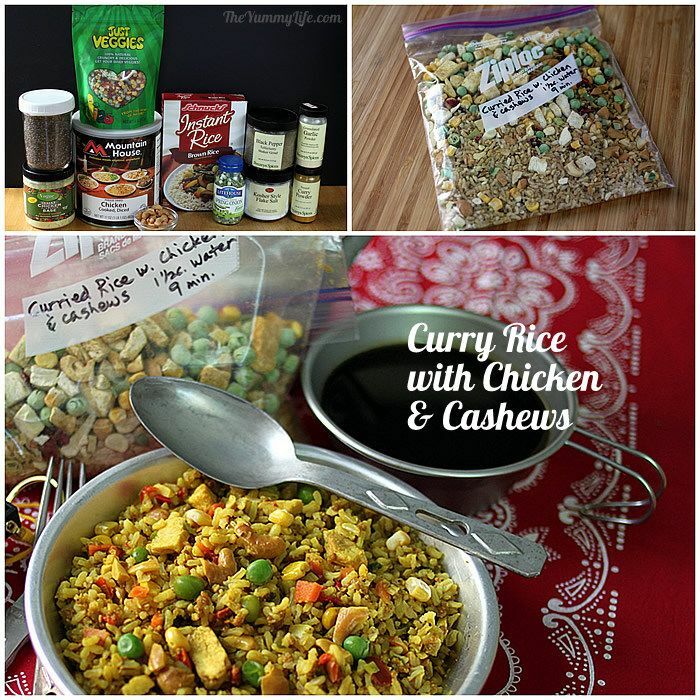 I added the Chicken Base one to all of my instant recipes since I was already using freeze dried chicken meat, but the VegeBase is a tasty flavor enhancer if you prefer a vegetarian meal. I bought mine on Amazon. They have a Beef Base, too, although I haven't tried it. Chia Seeds. If you follow my blog, you know that I'm a big chia seed fan. (See my Refrigerator Oatmeal post for details about the benefits of chia seeds.) I add them to lots of recipes for a neutral tasting nutrition boost. They completely disappear into these 6 recipe mixes. Nuts are added to 4 of the 6 instant meal recipes. They add protein, healthy fat, and other nutrients. If you don't like nuts, feel free to omit them. 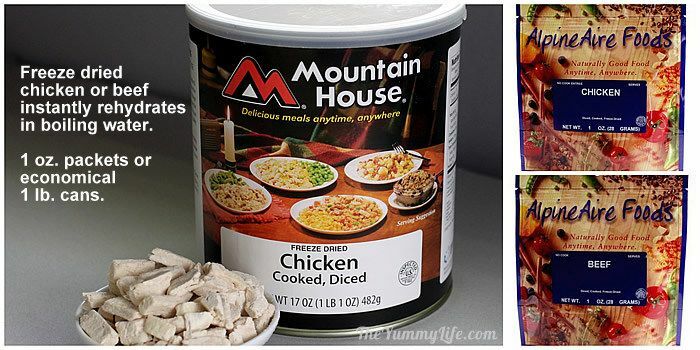 Freeze dried chicken or beef. (If you're vegetarian, of course you can omit the meat.) You'll notice that I only used chicken in my 6 recipes. That's because King-Man prefers chicken over beef, and it was more economical to buy a big can of freeze-dried chicken rather than smaller packet portions for more meat variety. It's surprisingly good once it's rehydrated with boiling water, and it has all of the nutrition of fresh meat. I bought my can of chicken on Amazon. IMPORTANT TO KNOW: These sealed cans and packets of freeze dried meat are supposed to last for many years (the can packaging says 25 years); however they only last that long if they're left unopened. Once the can or packet is opened and exposed to moisture, it begins to decay and bacteria can form. The meat should be rehydrated and eaten within a week or two. To extend it's storage life, you can store any leftover freeze dried meat in the freezer for future use. If you have a Foodsaver, vacuum sealing will extend the freezer shelf life for up to 1 year. I divide the unused freeze-dried chicken into 1-2 cup portions before vacuum sealing it for future use. 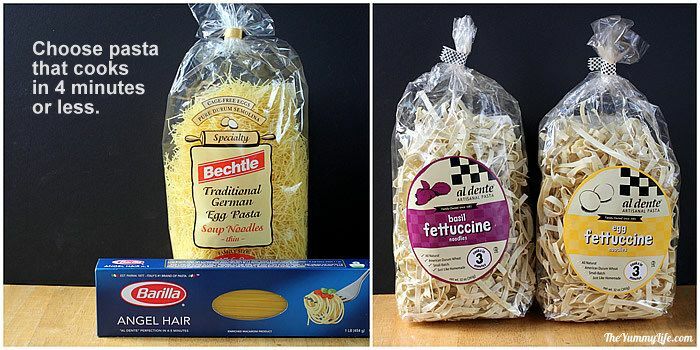 Dried Parmesan cheese (not freshly grated) -- I stay away from this dried, canned cheese for home cooking, but fresh cheese isn't recommended for these instant dried meals. 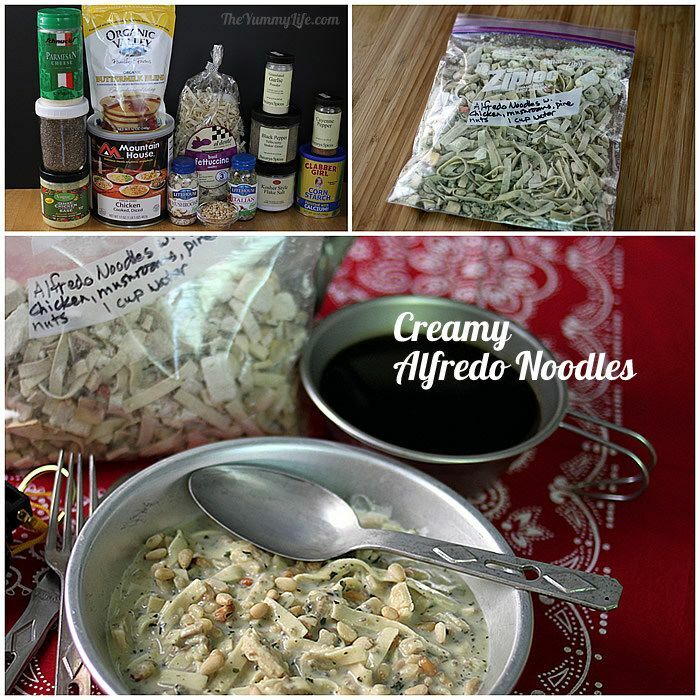 Look for a good quality canned variety to add cheesy flavor to the Alfredo Noodles. I like the Mama Francesca brand. First label plastic bags for each mix. I used freezer (not storage) quart Ziploc bags, because they are a thicker plastic and less likely to get holes. (They are BPA-free.) This is especially important for backpackers who want to add boiling water directly to the bag. 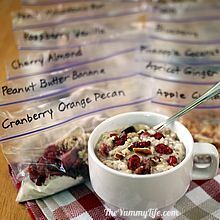 Label each bag with the type of meal, how much boiling water to add, and how long to let the meal soak before eating. I use Baggy Racks to hold my bags open as I fill them. It's like having extra sets of hands. 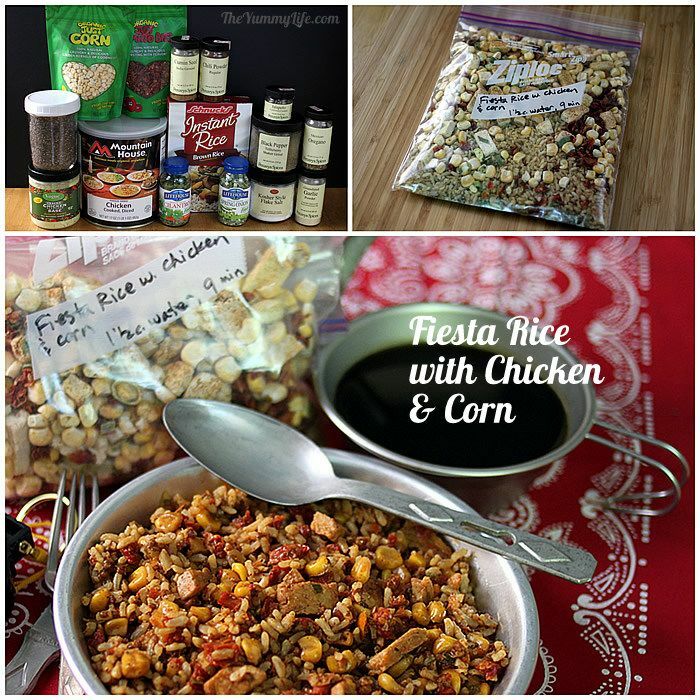 Simply measure and add each recipe ingredient to the bag. Done! 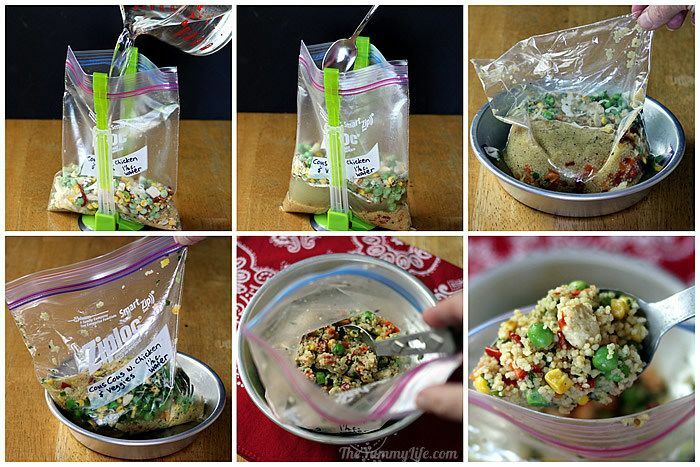 Your meal-in-a-bag is ready to take on the trail.......or anywhere. Method 1: In the plastic bag. If you use freezer bags, they are sturdy enough to pour the boiling water directly into the bag. 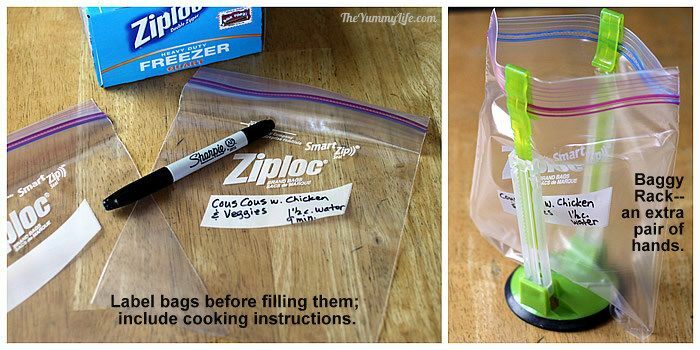 (Ziplocs are BPA-free.) Give it a stir, seal the bag, and let it rest for 9 or 10 minutes. I recommend putting the bag on a plate or bowl to give it a foundation (and also as a safeguard in case your bag springs a leak). Turn the bag upside down after a couple of minutes to remix the contents as is soaks. Open, stir, and eat. Easy! Method 2: In a covered bowl. 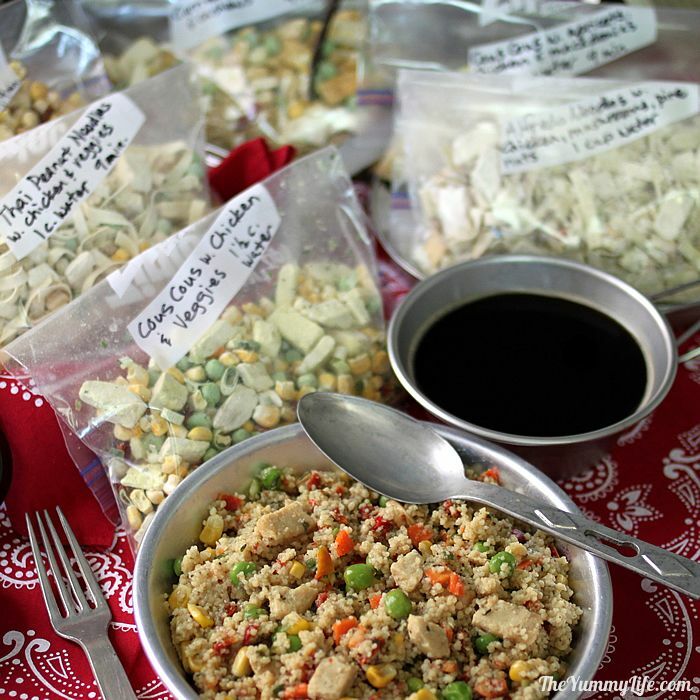 The first time King-Man took these homemade instant meals backpacking, he mixed them with water in the bags as shown above. It worked fine, but he thought it would be easier to to use a covered bowl for his next trip. Pictured below is one we found that is an insulated nesting bowl, mug and lid. It is lightweight and made specifically for backpacking. It was cold where he was hiking, so those features help keep the meal warm while the ingredients soaked in the hot water. Method 3. In microwave-safe soup mugs. 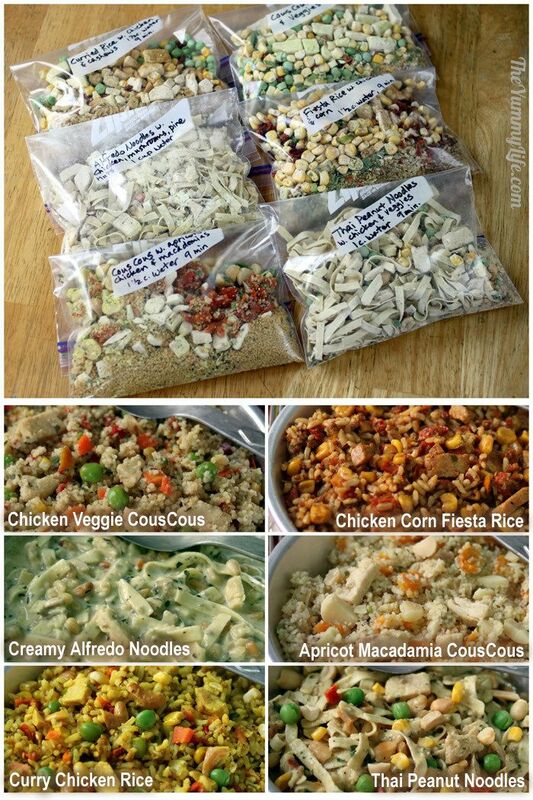 These are not for the trail, but are good options if you are making these instant meals at the office or in a dorm or hotel room. 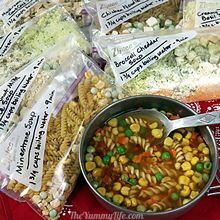 You can add the instant ingredients to the mugs along with the water and microwave them until they boil, cover them and let them rest until the ingredients have all softened. Or, boil the water separately and pour it into the mug with the instant ingredients; stir and let rest for 9 or 10 minutes. I have used both of the soup mugs linked below; both worked well. The weight of each recipe is included, since backpackers like to know that kind of thing. 1. Cous Cous with Chicken and Vegetables. Weight of full recipe in bag: 3.9 oz. Weight of full recipe in bag: 5.4 oz. Weight of full recipe in bag: 5.5 oz. Weight of full recipe in bag: 6.6 oz. Weight of full recipe in bag: 6.1 oz. Weight of full recipe in bag: 6.0 oz. What is the shelf life of these instant meals? It's hard to know exactly how long--it varies depending on the ingredients and where they're stored. They keep longer at cooler temperatures and unexposed to humidity. With freeze-dried meat included, these instant meals are good for 1-2 weeks at room temperature. Without the meat, they will be good for several months. I've made some in advance without the meat, kept the meat vacuum sealed in the freezer, and added the meat later as I needed the instant meals. If you vacuum seal the meat or entire meal with a Foodsaver, it should at least double the shelf life at room temperature. Vacuum sealed and stored in the freezer, they are good for up to 1 year. Humidity and moisture are the enemy! Don't be tempted to add any moist or wet ingredients to these instant packets unless you're ready to eat them right away. I carefully designed these recipes to have all dry ingredients. Once moisture is introduced into the mix, bacteria can begin to form and the contents are no longer shelf stable. 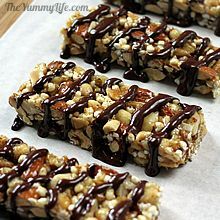 The only safe way to add wet ingredients is if you freeze them right away rather than storing them at room temperature. You can use my recipes as guidelines and get creative by altering the ingredients to your liking. 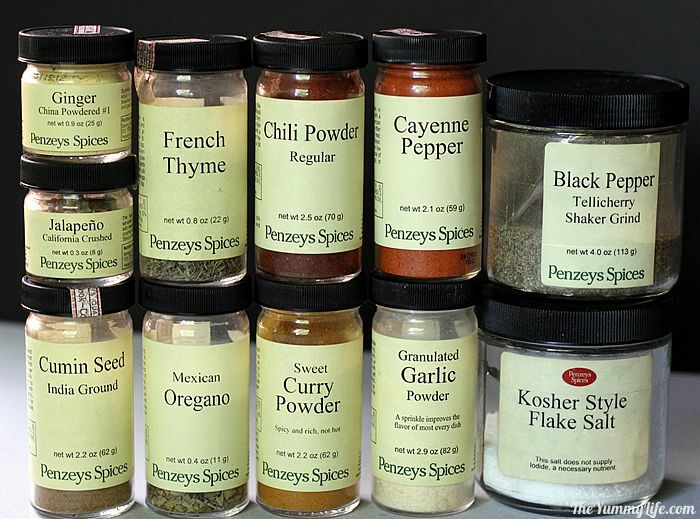 Omit ingredients you don't like, add different seasonings to your taste--these recipes are all customizable. Vegetarian or vegan? Omit the meat and use the Vegebase in place of Chicken Base. Add more nuts, if desired, to replace the protein from the meat. Skip the powdered milk and cheese in the Alfredo Noodles. Gluten free? Use instant brown rice in every recipe, rather than pasta or cous cous. Nut allergies? Leave them out. Omit the PB2 from the Thai Noodles. Like it spicy? Add a dash or two of cayenne pepper. On a low sodium diet? Omit the salt. Prefer more veggies and fewer carbs? 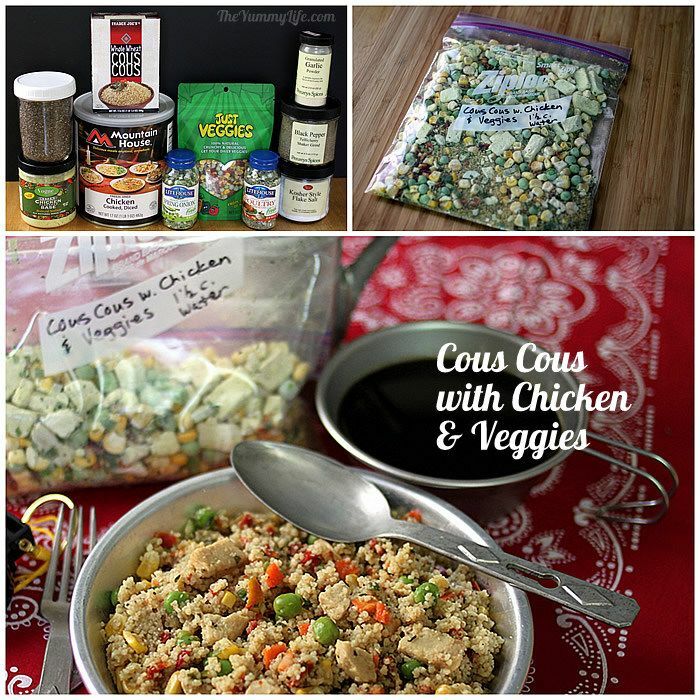 Swap out equal amounts of veggies for the pasta, rice, or cous cous. Stocking these for emergencies? Leave out the meat to extend their shelf life, vacuum seal and store them in a cool place. They are likely to be good for a year or longer. A trial run at home. 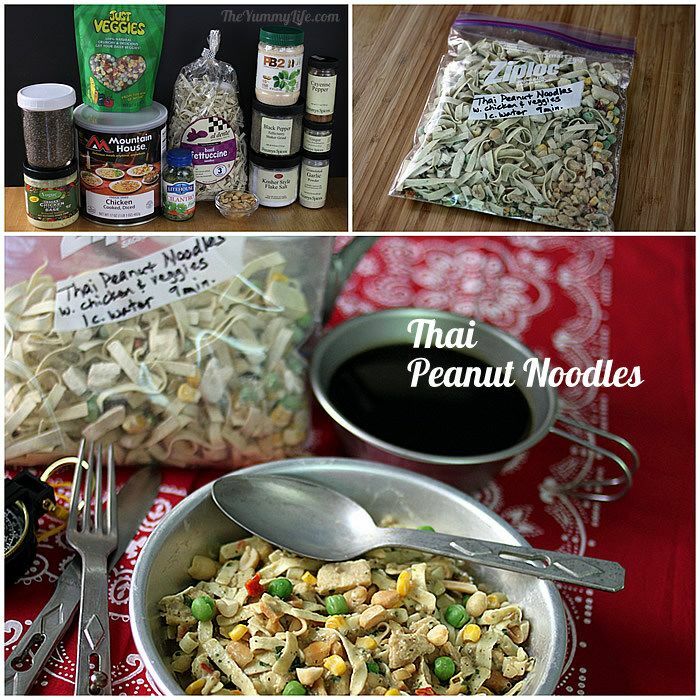 Before King-Man took these instant recipes backpacking for the first time, we had a few instant meal dinners at home first. It was actually kind of fun. And, that way he could sample them and make sure they tasted good and digested well. I made a few tweaks to the seasonings after our tasting dinners, so hopefully they will all taste good to you, too. More food for the trail. You can read about all of the food I prepared for a week-long backpacking trip--breakfast,lunch,dinner,snacks--in this post: A Week of Lightweight Nutritious Backpacking Food. 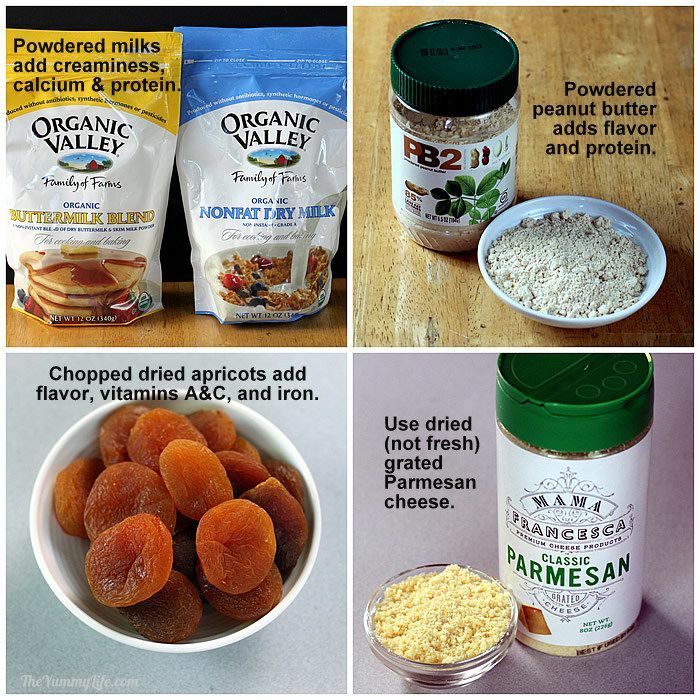 Here are three more posts with recipes for nutritious on-the-go food. However or wherever you may try out these instant meals, I hope you enjoy them. Happy trails to you!